Before taking a break for the summer, we rounded off our events with an “Afternoon Tea Party” followed by a programm of music and literature . The garden of the ancient Adlitz castle with its old English roses provided a perfect setting for our Tea Party prepared with much love by our British members and celebrated in style. 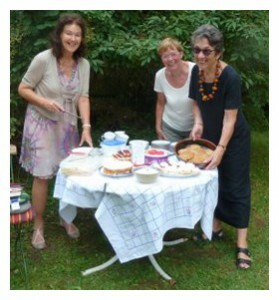 Homemade cakes based on original English recipes, scones, little tarts, shortbread, strawberry jam and clotted cream had been prepared and donated, accompanied by original English Twinings Tea produced in large quantities using a samowar. Although it had rained in the morning, the lawn and the comfortable wicker chairs were dry by the afternoon, and later the sun even shone on us. 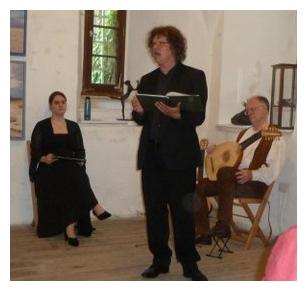 The 30 members and friends who attended as promised, together with some visitors of the exhibition in the castle formed a good audience for the programme of music and literature in the hall of the castle with its vaults. “How to drown eels. English Folk and Literary Tales” was the promising title of the evening. The texts by early English authors, often spiced with subtle humour, were read by the well-known and popular actor Martin Neubauer from Bamberg. 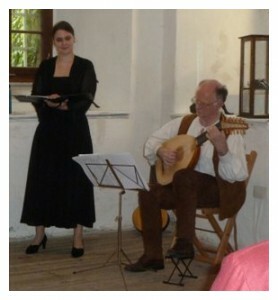 Young soprano singer Katharina Roeder from Würzburg performed old English and Scottish songs with a beautiful voice and a wonderfully clear and completely natural pronunciation, while being accompanied on the lute by “bard” William Buchanan, who teaches old instruments at the Würzburg Academy of Music. Their two hour performance of alternating poems and stories was very varied and amusing, and was therefore honoured by lively applause. The songs were so well-known to many listeners that they would have liked to sing along. Donations were willingly made to the collection box at the exit and covered a major portion of the artists’ remuneration. The Tea Party with its delicious bakery and tea were donated by those who prepared it, for which we would like to thank once more at this point. 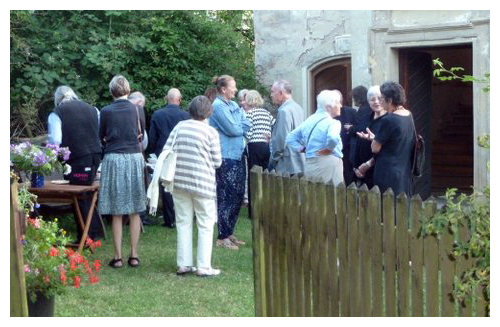 All participants were swept away by the atmosphere of the castle, the smashing tea party and the programme of music and literature, so wonderfully selected and performed in such a moving way.